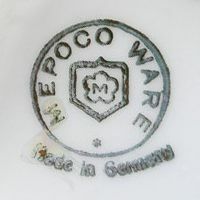 Like most companies in the 'Unidentified Companies' section, 'Mepoco' was not a manufacturer but merely an US-based import/distribution company. 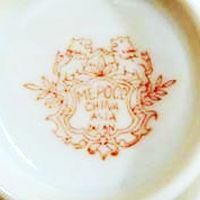 Examples show that they imported items from many different countries, including Czechoslovakia, Germany, France, Poland and Japan, even if the items from Germany or Japan are those most commonly found. The age of these items vary, as one probably notices when taking a closer look on how the marks evolved. However, the sometimes seen 'pre-1900' production claim is nonsense: first of all, the items are marked with country of origin, uncommon on such a large scale before 1900. And all country of origin designations are actually the 'cleaned up' versions used after 1921, meaning that they do not include pre-1921 versions like 'Nippon', 'Čechoslovakia' or 'Czecho-Slovakia' (also, Czechoslovakia itself did not exist before 1918). All that however is meaningless as the overall design and information supplied by various manufacturers actually points in the direction of the period between around 1919 and around 1935. Next to normal tableware, tea/coffee sets and of course canister sets, they also sold other items like porcelain clocks. 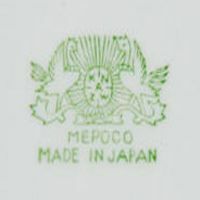 An interesting fact is that not only the clock casings were for example marked 'MEPOCO WARE Made in Germany', the clock faces themselves also include a printed 'Mepoco'. Other than that, there is nothing substantial known. A few items could by now be linked to certain manufacturers, e.g. the Steingutfabrik Annaburg (Germany), the Faiiencerie Onnaing (the only known French supplier for Mepoco), or the Porzellanfabrik Adolf Laufer (Czechoslovakia). The marks table presented here is incomplete. Next to omitting various versions only different in color, various images were left due to bad quality. If you own an image missing here and believe it should be presented, please drop me an ⇒email. 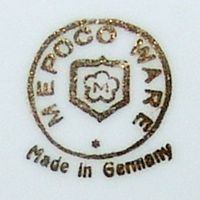 Simple 'MEPOCO' stamped above a mark of the Porzellanfabrik Adolf Laufer, Turn (1919-1936). 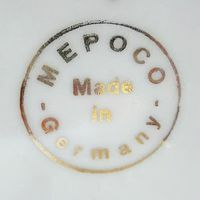 Simple circle containing 'MEPOCO' and 'MADE IN GERMANY'. 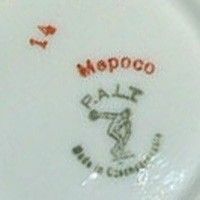 Circle stating 'MEPOCO' and 'GERMANY'. 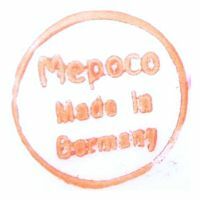 Simple circle containing 'MEPOCO' and 'MADE IN GERMANY', a 'modern looking' version. 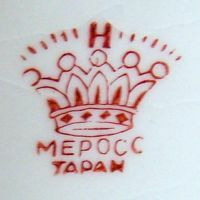 This mark type (here in gold) can also be found in red. ... can also be found in gold. 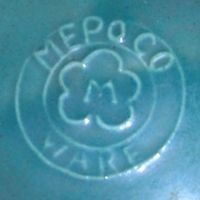 Round 'MEPOCO WARE' double circle mark containing 'MEPOCO' and 'MADE IN GERMANY'. 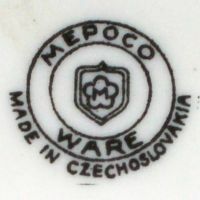 Double circle black 'MEPOCO WARE' mark with floral center and 'MADE IN CZECHOSLOVAKIA' addition. 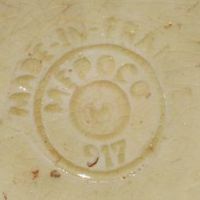 Double circle impressed 'MEPOCO WARE' mark with floral center, applied underneath the manufacturer name and country of origin. 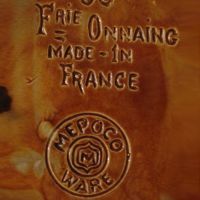 'MADE IN FRANCE' above a double circle 'MEPOCO' mark. The '917' contained within is the item number of Faiiencerie Onnaing, the manufacturer. Something completely different: inmold double circle 'MEPOCO WARE' mark with floral center. Item carried a 'MADE IN JAPAN' sticker. 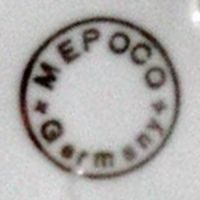 Simplistic mark form merely stating 'MEPOCO' above 'MADE IN JAPAN'. 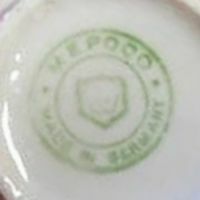 Two birds flanking an oval containing the initials 'K N A Z W', all that above 'MEPOCO' and 'MADE IN JAPAN'. ... can also be found in black. 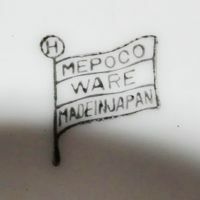 Letter 'H' above a large crown above 'MEPOCO' and 'JAPAN'. 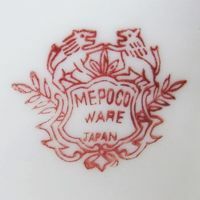 Two lions above a shield stating 'MEPOCO WARE' and 'JAPAN'. 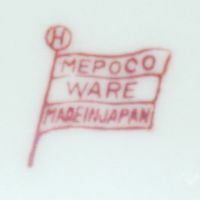 This mark type (here in red) can also be found in green. 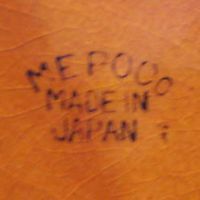 Similar mark as before, this time stating 'MEPOCO CHINA', 'ASIA' and 'JAPAN'. 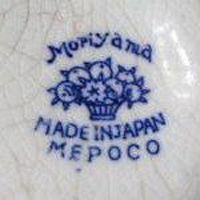 'MORIYAMA' above 'MADE IN JAPAN' and 'MEPOCO'.